Metal Art Printer Plus Stand Was Designed With A Larger Platform Surface To Accommodate Modern Printers And Combo Devices (Printer/Scanner/Copier). The Top Platform Surface Measures 18" Wide X 13-1/2" Deep. Forged From Powder-Coated Steel, It Provides A Wide, Raised Surface For Your Printer Or Monitor With An Accessory Shelf For Paper, Printer Supplies Or Even Your Laptop. It Also Creates Space Underneath To Store Your Keyboard Or Other Desktop Essentials. Perforated Hole Pattern In The Steel Provides Passive Airflow To Keep Your Electronics Cool. Protective, Nonslip Feet Keep Stand In Place And Won'T Leave Scuffs. Stylish, Multipurpose Stand Supports 50 Lb..
Metal Art Printer Plus Stand Was Designed With A Larger Platform Surface To Accommodate Modern Printers And Combo Devices (Printer/Scanner/Copier). The Top Platform Surface Measures 18" Wide X 13-1/2" Deep. Forged From Powder-Coated Steel, It Provides A Wide, Raised Surface For Your Printer Or Monitor With An Accessory Shelf For Paper, Printer Supplies Or Even Your Laptop. It Also Creates Space Underneath To Store Your Keyboard Or Other Desktop Essentials. Perforated Hole Pattern In The Steel Provides Passive Airflow To Keep Your Electronics Cool. Protective, Nonslip Feet Keep Stand In Place And Won'T Leave Scuffs. 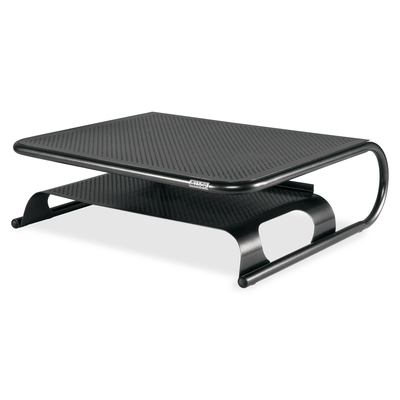 Stylish, Multipurpose Stand Supports 50 Lb.